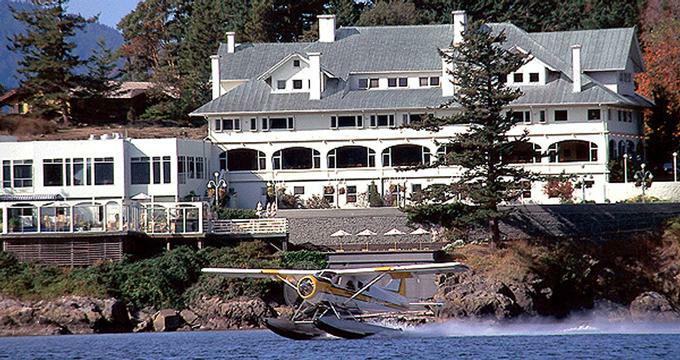 Rosario Resort & Spa sits in ocean-front splendor on the coastline of Orcas Island, the largest of the San Juan Islands, an archipelago located off the coast of Washington state. This beautiful island resort can be reached only by ferry, private boat or seaplane; its remote nature means quiet and solitude among stately forests, sparkling waters and teeming wildlife. The resort offers families and couples a place to retreat and wonder at the natural and unspoiled surroundings, while enjoying comfortable lodgings with unparalleled views of Cascade Bay. The resort is a perfect weekend trip from Seattle. Rosario Resort began as a private home in the early 20th century. In 1906, ship builder and former Seattle mayor Robert Moran built Moran Mansion as a home for his family. Inspired by the Arts and Crafts design movement, Moran’s architectural focus was on respect for nature, a return to hand craftsmanship and the space and facilities for spending time with family. The 40 acre waterfront property is still one that is harmonious with nature and designed for family. The original Moran Mansion is now a fascinating period museum which can be toured daily. Rosario Resort is spread over the large waterfront property, with several distinct groups of lodgings. All the rooms of the resort have televisions, a small fridge, free WiFi and coffee makers. Many of the rooms are fitted with gas fireplaces. The Bayside Rooms are closest to the Moran Mansion and the Rosario Marina. The Bayside Queen Rooms have partial ocean views and overlook the mansion and the marina. They have two queen beds and hold four guests. The Bayside King Rooms are identical to the Queen Rooms, except that they have one king bed and sleep two people. The Bayside Gardenside Suite has two queen and one king bed in separate bedrooms, a partial water view and sleeps six. 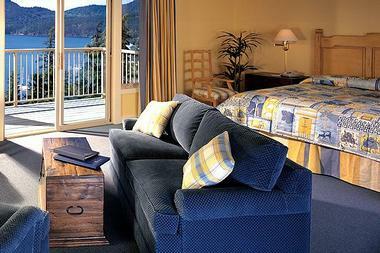 The Bayside Waterfront Deluxe Suite has large windows looking out on East Sound and a deck directly over the shoreline. It has a king bed, a sleeper sofa, a gas fireplace, a dining area and sleeps four. The Harborside Rooms are directly on the waterfront of Cascade Bay and are a 15 minute walk or a 5 minute drive from the Moran Mansion. The Harborside Queen has two queen beds and sleeps four. There is a balcony over the waterfront, with views of Cascade Bay and the Moran Mansion. The Harborfront King sleeps two and is identical to the queen room, but with one king bed. The Harborside Cascade Suite has two bedrooms, one with a king bed and the other with two queens. The living room has a twin Murphy bed. The suite has three full bathrooms, a dining room, a living room with a fireplace, three balconies and sleeps seven. The Harborside Hearth Suite sleeps three and has one bedroom with a king bed, a dining room, a living room with a fireplace, two bathrooms and two balconies with splendid water views. The Hillside Rooms are located high above Cascade Bay and look across the bay towards remote island vistas. These rooms are a 15 minute walk or a 5 minute drive from the Moran Mansion. The Hillside Queen has two queen beds, forest and water views, a balcony and sleeps four. The Hillside King rooms have one king bed, a balcony and sleeps two. The Deluxe King Room also has one king bed and a balcony, but also boasts a large bathroom with a jetted tub and separate shower, a living room with a gas fireplace and a kitchenette. The Two-Bedroom King Suite has stunning views of Cascade Bay, a fully-equipped kitchen, two bedrooms with king beds and private bathrooms, three balconies and a living room with a pull-out sofa and a gas fireplace. It sleeps five. The Residences at Rosario are two-bedroom suites perched on a hillside above Cascade Bay. Ideal for groups of friends or extended family, the Residences have two bedrooms, each with king beds, en suite bathrooms, HDTV, a sleeper sofa in the living room, a gas fireplace and a full kitchen. There are also two special suites at Rosario: The Roundhouse Suite and the Cliffhouse Honeymoon Suite. The Roundhouse Suite is a unique circular bungalow that was built as a playhouse for the Moran children. Built in 1913, this suite sits alone on a rocky bluff overlooking the Rosario Marina and Cascade Bay. It has one bedroom with a king bed and a living room with a gas fireplace. The Cliffhouse Honeymoon Suite has a king bed, an oversized tub and separate shower, a gas fireplace and a large deck directly over the water. It is an ideal and beautiful room in which to start one’s married life. There are three dining venues at the Rosario Resort, all of them focused on locally-caught seafood and locally-sourced produce and meats. 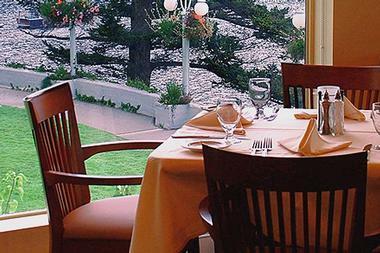 The Mansion Restaurant offers fine dining with a view as the dining room overlooks Cascade Bay, and is located in the original veranda of the Moran Mansion, now covered. It offers fine dining. The Moran Lounge is found in the original living room of the mansion and serves fireside cocktails and a delicious bar menu. The Cascade Bay Grill and General Store is a down-to-earth eatery with a children’s menu and a list of offerings that include oysters, grilled salmon, fish and chips, bratwurst, pizza and burgers. The Spa at Rosario is designed to help you relax, unwind and fully enjoy time on the island. The spa has an original indoor saltwater pool, used for therapy and quiet time, a whirlpool, a mirrored fitness studio, an exercise equipment room and a sauna. The spa’s treatment menu includes massages tailored to each guest’s needs. The Island Time massage induces relaxation and restoration and consists of light and firm touch. Prenatal massages are available, as are foot and hand massages. Chair massages tend to stiff and aching neck, shoulders and back. Aromatherapy, using locally-made botanical oils, can be added on to any of the spa’s massage options. Hot stone treatment combines the deep heat of stones, gathered from the resort’s shoreline, with massage. Nourishing body wraps are available, which begin with exfoliation using a soft bristled brush and envelops the guest in a mango enzyme masque. While enjoying the revitalizing benefits of the body wrap, guests receive a neck, shoulder and foot massage. The facials offered at The Spa at Rosario include the Rosario Signature Facial, which takes each guest’s individual needs into account. It uses organic ingredients to cleanse, tone, exfoliate, hydrate and nourish skin, and includes massaging of the neck and shoulders. The Luxurious Hydration Facial makes use of organic, vitamin-rich ingredients and includes a peel and eye and lip treatment. Additionally, facial and body waxing are both offered by the spa. 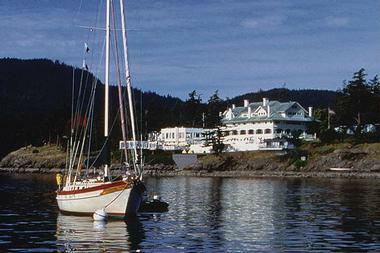 There is a wide array of things to do at the resort and on Orcas Island. Swimming and hiking are popular activities. The Moran Mansion Museum is open daily and is a tribute to Robert Moran, who designed and built the home. It is replete with early 20th century photos, Arts and Crafts period furnishings and a large display of the ships built by Moran Brothers Company in Seattle. Whale watching tours are a popular activity and narrated tours leave from the marina daily. The San Juan Islands are home to Orcas (Killer Whales) and Minke Whales; sighting one of these giants is an unforgettable experience. Guided kayak tours can be taken by beginner or experienced sea kayakers. Fishing charters are offered and the catch of the day might include salmon, crab, halibut, prawn and bottom fish. The fishing charters are family-friendly and the cost covers a gourmet boxed lunch. Elsewhere on the island vacationers will find bike rentals, a park with baseball diamonds, basketball hoops and tennis courts, a farmer’s market selling food and the wares of local artisans, horseback riding, studio tours and a skateboard park. Orcas Island Country Golf Club is a PGA-rated 9-hole course, visitors may rent golfing equipment and golf carts. Moran State Park is a 5,000 acre preserve with thirty-eight miles of trails, lakes, waterfalls, swimming, and paddle boat rentals. Orcas Island is home to diverse wildlife species. Keen birdwatchers can spot bald eagles, great blue herons, oystercatchers, trumpeter swans, peregrine falcons, northern harriers and barred owls. River otters, sea lions and porpoises are regular visitors to the shore. Hikers may meet a red fox or the Columbian black-tailed deer. Weddings at Rosario can be held inside the Moran Mansion or outdoors on the Rosario Point Lawn. The lawn is a beautiful place for a summer wedding, set on a promontory with 360 degree views of Cascade Bay. Weddings in the Moran Mansion are held in the lovely and historic Music Room, with its rich mahogany furnishings, pipe organ, fireplace and stained glass windows. Next read: Romantic weekend getaways, Weekend Getaways from Seattle.